An American couple who fell in love with Trinidad in 1996, ran away from friends and family back home to quietly exchange wedding vows on a beach in Blanchisseuse in September 1997. With a bandana on his head, three-quarter pants and a tie, a barefooted Dean Naleway, a record producer from Los Angeles, California, became the husband of Shannon Clark, a film producer also from LA. 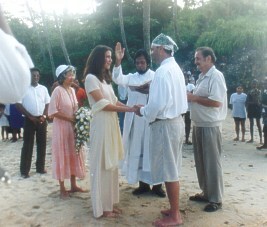 With hand upraised, Fr Winston Joseph blesses the marriage of American couple Dean Naleway, (with bandanna) and Shannon Clark, She, too, stood barefooted on the white sandy Laguna Mar Beach before the officiating priest, Fr Winston Joseph, who said he did the ceremony because of his friend Fred Zollna. In addition to Fred, who was drafted as bestman and, and his wife Barbara as maid of honor, Eddie Wades three piece steel band "Pan World" serenaded the couple while bathers and resort employees gathered to witness the first beach wedding in Blanchisseuse. The simple ceremony lasted about 20 minutes with the couple exchanging white gold rings they designed for each other. Later, said Naleway, he and his new wife would exchange private vows they composed themselves, in the privacy of their rooms. After the ceremony, they smilingly walked hand in hand to the Cocos Hut Restaurant to celebrate with specially invited guests. "When we get back to LA we will have a big reception for our friends and relatives," said Naleway. "But we wanted to keep this part of it very simple and very private, thats why we eloped to Trinidad."